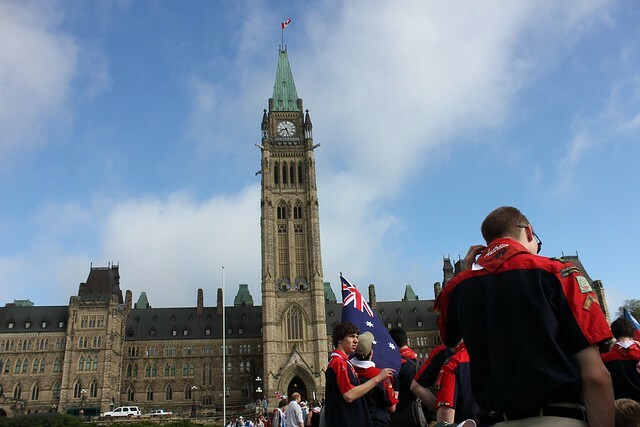 Once breakfast was over, it was time to walk down to the Canadian Parliament, kick back and wait for the Governor-General to show up and officially start the show. Turns out that the Australian flag had been misplaced, but luckily we had been using a flag taped to Pete’s Oar as a “follow me” beacon so no harm, no foul, I suppose. We had run into a few members of the Finnish Contingent during our time in Washington DC, and there had been some interaction at the University and Mexican Party, but this was the first time I saw just how many different countries were being represented at Moot Canada — 81 in total. But at length, the Canadian Governor-General arrived, and he made his way up the central aisle through all the Rovers waiting. He seemed like a pretty good guy — Frizzy Lizzy even managed to get herself a selfie with him, but I’m not sure if he was aware of it or if she just stood there waiting for him to walk past. But, with the GG’s Personal Standard fluttering high above, it was time to begin. 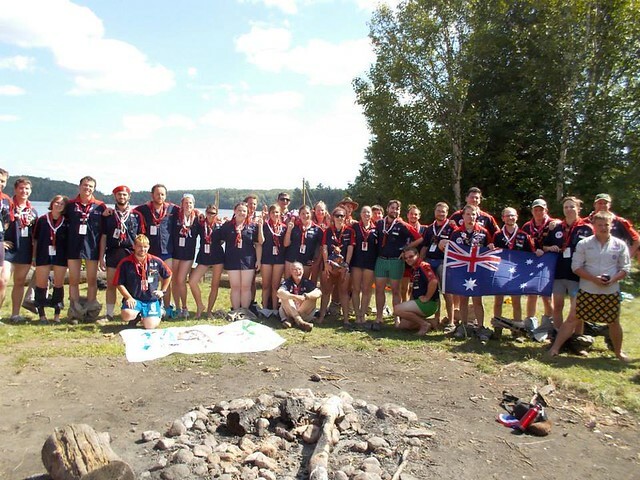 The Opening featured a handover from the sole Kenyan there, speeches from the Governor-General, the Chiefs of Scouts Canada and Scouts Du Canada, what we would call a “Welcome to Country” type speech from a local First Nations Elder, and a representative from the World Organisation of the Scout Movement. Towards the end, most of those people signed The Book. All in all, a lot of talking and formality! Once we were officially open for business, there was a brief pause while we waited for the Governor General’s Foot Guards to parade on the lawns next to us. During this time was taken the first of several Contingent photos. Once the soldiers had completed their ceremonial duties, they marched off down the street and we followed on after them, heading to a smaller park about a kilometre away where we would meet the other members of our international patrols. The Moot team had put us into Patrols based on our choice of “Urban Experience” with a secondary goal of exposing us to a variety of cultures. I thus I found myself in a patrol with Sophie from the UK, Jerone from The Netherlands, Karine from Brazil, Pablo and Betty from Mexico and Ida from Finland. We met up and were issued with box lunches and directed to wait over there for the buses to arrive. When the buses pulled up, we were excited to see that they were the iconic yellow North American school buses. That excitement lasted only as long as it took to climb aboard. You see, those yellow school buses are used to transport elementary school students, not adults. It was not a comfortable hour that we spent driving from Ottawa down to the moot site at Awacamenj Mino Scout Camp, but it was at least a pretty one. The road was following a nice river for most of the time it wasn’t in the city. None too soon, we made it to the site and were told that we needed to wait for the rest of the buses from our group that had gotten mislaid to catch up (navigationally challenged bus drivers would prove to be a hallmark of the event) this struck me as incredibly arbitrary, but I was happy to run with it until, when we finally were let into the site, we found that our next challenge was to pick our bags out of the pile of 2,000 in the main eating shelter. We were able to find most of our bags, and we set off for Subcamp Two to find our campsite. Conveniently, we were actually pretty near to the eating area/entrance and a reasonable distance from the collection of porta-potties that were supplementing the woefully inadequate amenities that were at the site. There was also a cold-water shower not too far away. As we set up our tents, we were joined by many other patrols and before we knew it, it was time for the first of only a handful of community dinners that were scheduled. These community dinners would have one thing in common with each other: horrible, horrible menus. The first night’s just consisted of one hot dog, and a bag of potato chips, possibly with some fruit. Needless to say, the poutine vendor did excellent business that night. On this night, there was also a second opening ceremony, but I was tired and thought that reopening an event which was already open was dumb, so I went to bed instead. I understand there were canoes coming off the lake involved however. By the glorious property of timezones, back home familiarisation day was also my brother’s 9th birthday so I went investigating where I might find myself a payphone to wish him the best. However, I’d messed up my maths, so $30 later I had left an incredibly expensive answering machine message because it was 5.30am instead of 7.30am like I thought. It’s the thought that counts, right? I’d said that I would meet up with the rest of my Patrol after they’d finished the scavenger hunt around site, so I went and did a bit of exploring myself. Right near the payphones was the Contingent Area, and as one of the larger contingents, Australia & New Zealand had a “tent” (actually one of those temporary garages made from tarp material) all to itself. 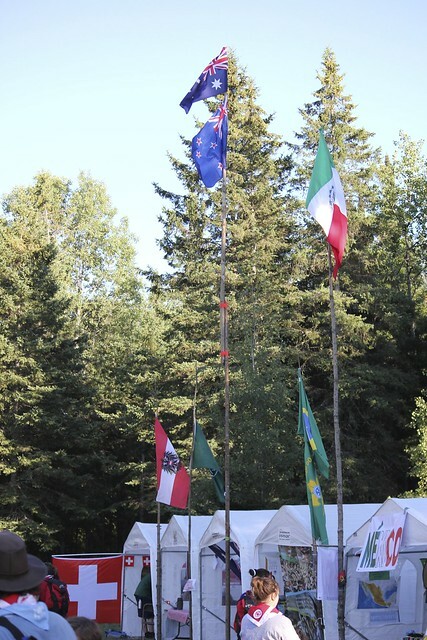 We had placed regular sized flagpoles on either side of the tent with an Australian and NZ flag on it, as had done the other contingents. However, when I arrived to have a look at the area, the Mexicans were in the process of building a large and elaborate flagpole. Lethal and I both agreed with our glorious leader, Pete that this could not be allowed to stand. Naturally, once the one-upping had begun we were going to do our best to be in first place. So we found two very long branches, lashed them together and then tied them to the side of our tent. Up our new, large flagpole were sent the Australian and NZ flags from before — plus a pair of Pete’s boxers for good measure. Well the Mexicans saw our large pole, and spent the next hour building an elaborate tripod to hold up an even larger flagpole which was an entire tree and may or may not have been specially felled for the purpose. But that was OK, as immediately behind our tent was a small stand of pine trees, pine trees that Lethal proceeded to climb and with my help, dragged our large flapole up about 15-20 metres to the top of the tree where we again claimed our rightful place on the top of the flag-height tables. The Moot was designed so that for most of the time, only half of the participants would be on site. My Unit (4 patrols made a Unit) was staying on site… so with the dawning of Day Three, we began our first activities. We started off with the Global Development Village, where we did some simple Messengers of Peace-type activities one of which was learning about landmines, the other was a bit more esoteric, and I’m not entirely sure what it was about… there was a bit of a commando course thing, it was all a bit odd. Our afternoon activity was much more fun, we went paddling on the lake, charmingly known as “Lac de Iîle” – but only after receiving a pretty terrible “briefing” from an Archery leader from the UK who was at least open about the fact that he had absolutely zero knowledge of the activity beyond the simple stuff on his info sheet. So we set off around the island and after a while we rafted up and had a bit of a lay down just talking about our experiences so far. Half an hour later, we’d drifted to the far end of the lake and figured that it would be a good time to head back to shore. That night I went wandering again and I soon discovered the neighbouring subcamp, confusingly this was not Subcamp One or Subcamp Three – but instead Subcamp Seven. 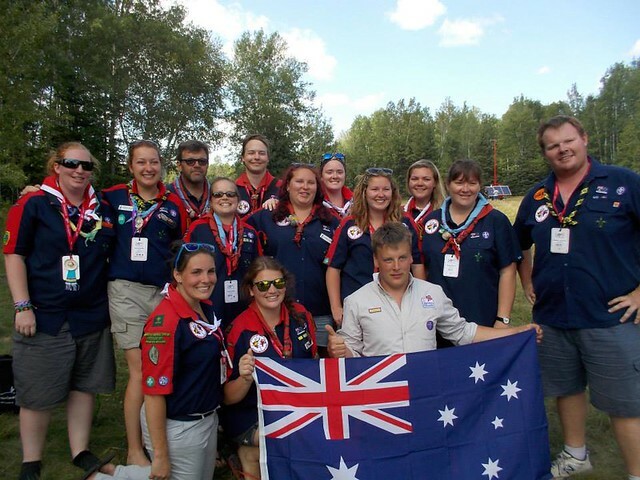 On the plus side however, this subcamp was run by a couple from Melbourne, Chris and Lea who I knew reasonably well. Chris was running a tight ship, and amongst his Rovers were Brother Gogerly and Mr Beeby. 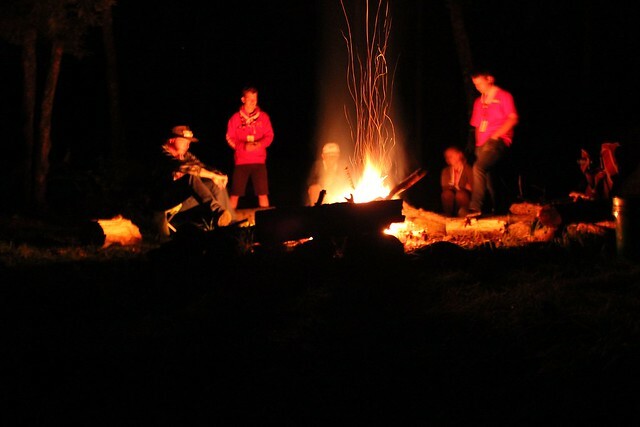 Being a generous soul, I gave them a hand starting their campfire before continuing on my way. Our second day of activities, was offsite in Ottawa. We were supposed to spend the day doing a couch rally, but I tired of that activity extremely quickly and went off to explore the city. I also took the opportunity to snare myself some more delicious Tim Horton’s baked goods. Canadians are correct to be obsessed with them. I saw the Rideau Canal in operation, the Houses of Parliament, Supreme Court, Canadian Archives & Library, a bunch of other cool-looking buildings and went through the Museum of Civilisations, which I strongly recommend to anyone who happens to find themselves in Ottawa with an afternoon to spare. One evening, early in the Moot, we were spinning a yarn about that most vicious of Australian animals, the Drop Bear. Explaining carefully the many brutal aspects of these fearsome creatures, we corroborated each other every step of the way, up until it came to the death toll amongst Victorian Rovers for the year. I said 12, but Brother Gogerly was firmly insisting that there had been 13 fatalities. We counted the “deaths” for a bit, before he revealed that “Chris from Corhanwarrabul” had been attacked shortly before we had left for Canada. Not knowing this, I had to excuse myself for a while, while Brother Gogerly continued the story. Another thing that happened during this part of the Moot, a number of participants got to talk with the astronauts on the International Space Station, including Ross – so that was kinda interesting, as they were facing a number of the same issues that we were in working across cultures. It was also interesting in that we had a VOIP (or similar) connection to an Amateur Radio Operator somewhere in the western United States who was transmitting to the ISS on our behalf. There were a few issues and only the first few people got to ask space their questions. Food at the Moot was an interesting experience. We were cooking in Patrols for most meals, aside from Breakfasts which were in the Main Tent and generally consisted of a Croissant, a piece of fruit, a small tub of yogurt and a juice box, and the infamous “community dinners” — so we had some level of control over our meals. Unfortunately, the ingredients we were issued were quite limited – one poor girl was allergic to all of it, and despite being on the “special diets” list still ended up getting admitted to the local hospital after not eating for several days. Worst of all, everyone was issued bunches and bunches of celery at every meal. It was even written into the job descriptions for the next Australian Moot that Celery was not to be permitted on site… that’s how much celery we had! Everyone was back on site, and we started out in our Sub-Camps talking about our different cultures and teaching each other different words and phrases in our languages and dialects. After lunch, we headed to the Contingent Area, where each Contingent was given it’s own tent to decorate and inhabit during the Moot. National songs were sung and chants were shouted, and I said “grouse” more on this one day than I have in the rest of my life. Someone had brought a proper, Aussie Rules, footy and I managed to teach a few internationals how to do a drop punt. Football, in all it’s incarnations was a big part of the day. There were two soccer fields available and for most of the day there were four teams duking it out. Later in the day, we were going to take over to play the UK in rugby. But before then it was lunchtime. Many people had brought to the Moot food from their culture, and once we got our hands on a barbecue, we were no exception. A team was dispatched to a local supermarket and returned with a couple of hundred dollars worth of delicious meat. Of course, this was an off-budget expense so we had to find a way to pay for it… we turned to an Australian tradition: the meat tray! Of course, that meant we had to explain what a meat tray was… In the end we called it a meat lottery and that got the point across, especially when we mentioned that one of the prizes was in fact a breakfast tray, complete with delicious bacon. Anyway, we set up the barbecue at the back of the tent and started spreading the word. I ended up manning the sauce bottle, and found that the people manning the plate had passed on a wide array of inappropriate “traditional australian thank-yous”. In the face of such blind instruction-following, I had no choice but to tell them they were being too timid, that the key to using such phrases was confidence, and that they needed to try again before I’d sauce them. Another part of cultural day was cultural dress/scout uniform. I was rocking my drizabone, which was really hot so I had shorts and thongs underneath with the green and gold contingent shirt. Most Australians went with the flanny, or a bluey, or both… there were a few other good ones, such as Ferret and Alisha dressing up as Crocodile Dundee and a crocodile. Mid-afternoon came along, and it was our turn at the sporting arena. The Moot Ashes had been organised ahead of time with the UK Contingent and Moot team, so we took to the field with a Haka (which was lots of fun, even if I couldn’t remember exactly how to do it) and rousing rendition of Waltzing Matilda while the Brits responded with God Save the Queen. But shortly after the game got underway, everyone was sent back to the their subcamps due to a massive downpour of rain. Once I recovered by drizabone from an opportunistic Rover, I didn’t see what all the fuss was. It was just a cool summer shower, although it did take a while to stop. 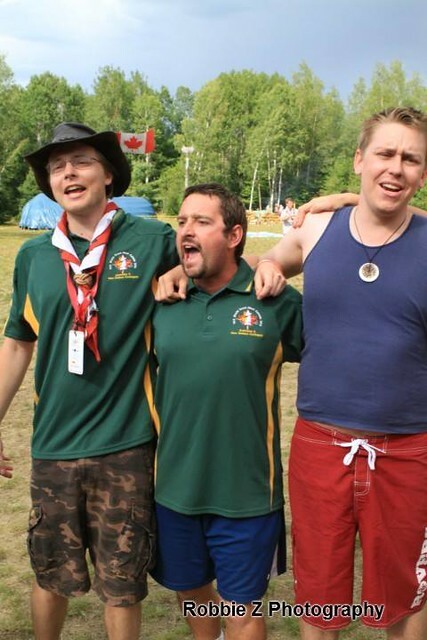 We never did find out why we had to waste our time – especially those Subcamps which had lacked a large structure to shelter under like ours had. By the time we were allowed out again, it was almost time for another one of the dreaded community dinners. We had been promised a “typical Canadian meal” but what we received was some baked beans, a dinner roll and a bit of cabbage (at least it wasn’t celery) — Canadian Rovers I ran in to were just as disappointed as I was (and apologised, because Canada.) Luckily, since the afternoon was cut short, we still had a lot of snags left over … so it was time for a contingent barbecue! After dinner, a group were discussing the dating profiles that they had put up in the “Rainbow Cafe” and the number of propositions that they had received. I mentioned that I didn’t know where the Rainbow Cafe was, let alone received any responses and the group decided that this was unacceptable. Ferret grabbed me by the arm and walked me all the way from the Main Tent down to the Rainbow Cafe, which was down by the lake. As we approached, we saw that they were having a “movie night” and when we got near the door, Ferret was vocal in what … parts of the human anatomy she could see in the film being shown. For some reason Alisha wouldn’t let her in after that. My Urban Experience was in Quebec. Figuring that since we were in for such a long ride, we assumed that we would be in a grown-up bus for the nine hour drive from Awacamenj Mino to Quebec City, but alas it was not to be. We climbed aboard the yellow perils with a sense of dread, with many taller passengers claiming seats next to the aisle, at the back of the bus and just also giving up and lying in the aisle hoping for some semblance of comfort. We took a pretty easy drive up, stopping relatively frequently at Tim Hortons’ and/or rest stops depending on the whims of our drivers. But after nine gruelling hours, we made it to our home for the next few day and a half or so, the Université Laval. First order of business was a hot shower and shave, followed by finding the dining hall. After so long at Awacamenj Mino, just seeing the University cafeteria was like mana from heaven. We had choice, multiple courses and didn’t have to cook it ourselves. It was amazing. After dinner, it was time to get back onto the buses, but this was OK as it was only for a 10 minute trip into the Old Town. 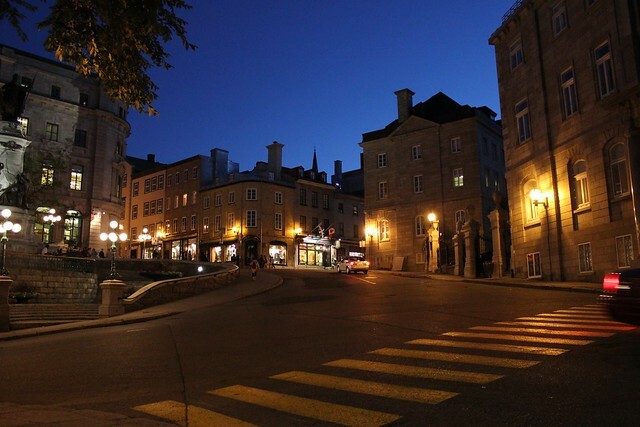 The Old Town is the part of Quebec City which is within the town wall. 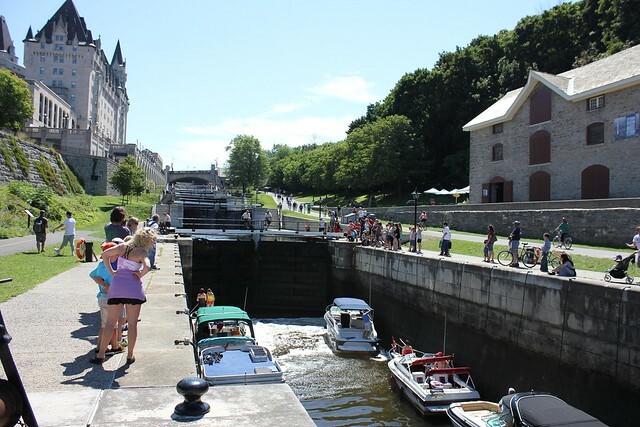 The entire place is a UNESCO World Heritage Area and after we walked down from the Manège Militaire Voltigeurs de Québec, past the Parlement de Quebec and through the gate, it was like we were stepping across the Atlantic Ocean. Cobblestone streets and tiny narrow houses were everywhere. 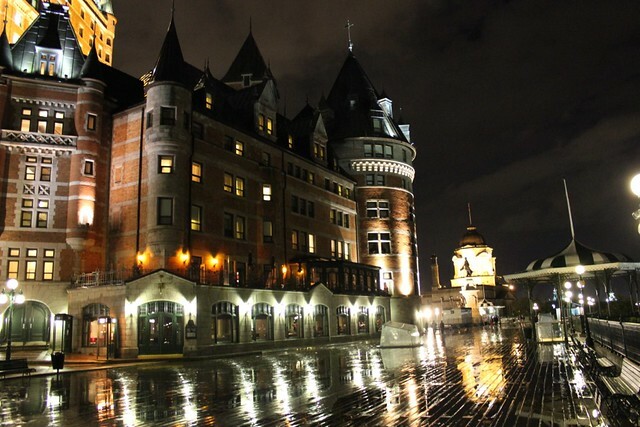 The most impressive part of the city is of course the glorious Château Frontenac, which despite looking like a grand French building from the glorious days (if any) of New France, was in fact built by the Canadian Pacific Railway in 1893. I’m sure that other pieces of fairytale architecture there have similarly banal details behind them… but pay no attention them, as Old Quebec is a fantastically beautiful part of the world regardless of how old the buildings actually are. One thing that I noticed is that as well as many public spaces (gardens, plazas, promenades, etc) there was also a lot of street performers. Possibly we were there over the weekend, but I suspect that it’s just a part of the culture of the city that a) there are street performers and b) people stand there and watch them. Some of the performers were quite good, but I was more in the mood for exploring than watching shows, so I normally moved on pretty quickly. One street performer I came across though needs mentioning, sitting alone underneath St Edward’s Gate, halfway around the world from home, was a man playing his didgeridoo. Next morning, it was time for the second hot breakfast of the Moot, and boy was it wonderful. After that, those of us on the Cultural Path – learning about the First Nations people of Canada, got on a bus and headed to Village-Des-Hurons, a reservation on the outskirts of Quebec’s metropolitan area. At the village, we were welcomed by an Elder and after that we began our service activity, which in my case was picking up rubbish around a local park. This was not appreciated on the grounds that “I did not travel halfway around the globe in order to pick up litter.” Still, it was right by a river and that was nice. 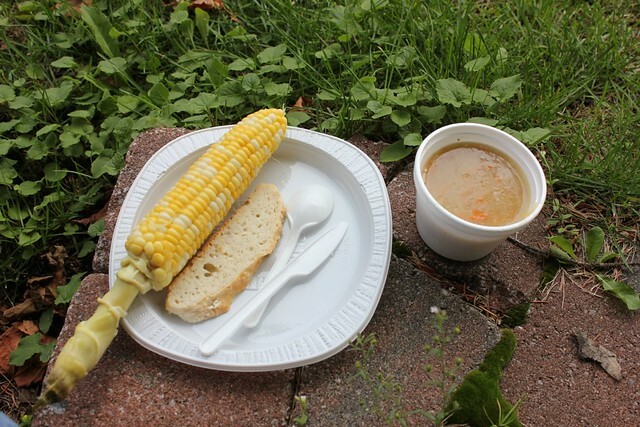 Then it was time for lunch, so we abled back into town along the river where we were treated to a native spread… bread made from corn, corn on the cob, with an entree of buffalo & bacon soup (also featuring corn.) It was quite tasty! We had over an hour for lunch, so after we’d finished eating, I went for a walk down main street with a group of Rovers from Sydney… Really stretching my horizons, right? Anyway, there were a bunch of stores and I picked up a number of hand-made souvenirs. I also spotted a traditional “tennis racket” snow shoe on display next to a lightweight, modern alternative. When lunch was over, we moved on to the local museum, the Hotel-Musee Premieres Nations. There were exhibits inside, but outside the museum there was a traditional garden which showed, amongst other things, how they grew beans and squash by using corn stalks as a support in a system called the Three Sisters, as the beans would provide nitrogen in the soil, and the squash’s broad leaves created shade. Other popular horticultural choices included sunflowers and artichoke. The trees that were cut down to build these gardens were then used to construct longhouses and palisades. 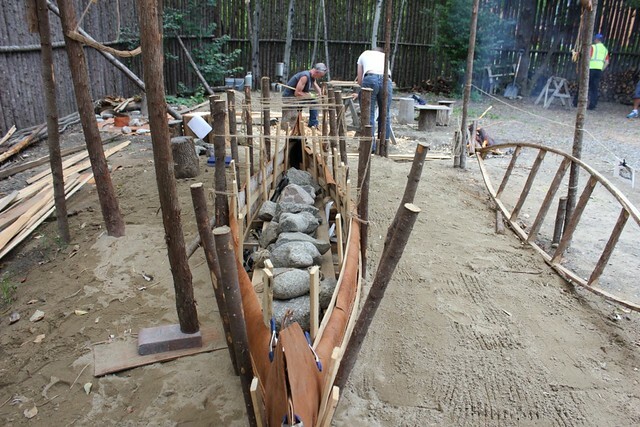 As well as the longhouse, the museum palisade also contained a small workshop, where craftsmen were building a bark canoe using traditional methods. After the museum, we moved down the road to see the house that the British had built for the use of the Chief during the 1800s. It was still in pretty good nick, and I have a feeling that the house was itself used sparingly for formal events. A trip to the town’s catholic church, Église Notre-Dame-de-Lorette came next. It was built around 1730 and has come to signify the tribe’s conversion to the Catholic faith. Built in the traditional style for missionary churches in Canada at time the church building displays both Christian and native religious artistry and figures. We were also told the story of the local Saint. Speaking of church, I couldn’t help noticing the large number of cemeteries in the village, assumably to cater for people of different faiths. Soon, we were back on the bus to the University, where it was time for dinner. Coincidentally, this dinner was when I met Jenna, who has a bit part later on. Anyway, we had some sense that after dinner, we would be going … somewhere, but surprise, surprise, no one I hd spoken to knew anything specific about these plans. 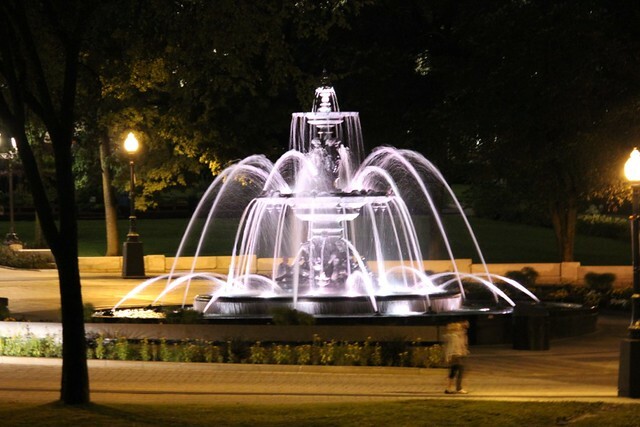 As we discussed this problem over dinner, we agreed that we should track down one of the people running this urban experience and ask them for the details. On the way out, I spotted a person in a red scarf. After quickly confirming with my Moot Handbook that people with red scarves were indeed important, I went over and introduced myself. Unfortunately, he was a Québécois and didn’t have a good understanding of english. Luckily, the man standing next to him was the chief bus driver from our little expedition, and he had also been trying to get similar questions answered so that he could ensure that his team were able to get their crew rest ahead of a long drive through the night back to Ottawa and Awacamenj Mino. He shared my frustration with the way the whole event had been organised. After a little while, we established that the buses would take us out to the activity at 7pm, return to the university for the drivers to rest and then return to pick us up at midnight. As it was already after six, I did my best to help spread the word. Eventually, we were all hanging around the buses and were informed that the activity planned for the night was in fact an indoor beach party. For some reason this didn’t go down well, but since it was the beach and the expedition team had gone to such an effort, about half a bus full of Australians and one really keen Irishman climbed aboard, whilst the rest of the group negotiated to get taken back into the city. After a while, they got that sorted out and it became clear that they needed some of the seats on our bus. We weren’t particularly fussed, but did feel bad for the two Canadien girls who had set the whole thing up for us. So at long last, we were on our way back into Old Quebec, singing deeply inappropriate songs quite loudly. It was interesting to watch out the window, as people would hear that we were singing, have a listen and figure out what we were singing, and then in that great francophone tradition, pretend not to be able to comprehend english. We continued singing after getting into town, but switched to singing Australian songs such as Waltzing Matilda, Home Among the Gumtrees and Down Under when it became clear that we had run out of Australiana-type songs that we all knew the words to. But that was OK, as by this time we were walking up the city walls and that was a bit of a walk. This proved to be somewhat of a blessing, as the showers weren’t too heavy — just enough to clear the streets a bit, and to put enough water on the ground to give some really nice reflections. We started making our way slowly back towards the armoury as it was starting to get a little late… but not so late that we couldn’t stop for some ice cream! It was right on midnight when our little group made it back to the city armoury, but the buses were nowhere to be seen. Five minutes passed, then ten. Finally, they appeared at 1am. The buses pulled up, and everyone stood there. A Sydney Rover with dreadlocks sprang into action, marshalling people into place. I gave him a hand, and for my trouble I was rewarded with all the seats on my bus being full when I was ready to jump on. I ended up heading back on the bus behind :’( I’m pretty sure I didn’t get any sleep on that ride, so at least I got to hit up each Tim Horton’s on the way as we drove through the night. We reached the campsite as breakfast was being served, so I grabbed myself a handful of croissants and headed back to my tent. But more importantly, we had unfinished business with the United Kingdom. Our Rugby game had been interrupted by the storm on Cultural Day, whilst the Cricket hadn’t even had the chance to begin. That evening, the teams again assembled on the field of battle. After spending my time in the previous half game hanging out on the reserve bench, I was called up for the replay after finding myself one of only 4 more players than were needed for a team had arrived at the beginning of the match. As you can see, I’m not wearing the contingent shirt. We got straight down to brass tacks this time, not bothering with the formalities of shouting at each other. My second ever stint on the rugby field showed that my skills from primary school hadn’t left me. I was able to catch the ball and then legally pass it to a teammate. Success! 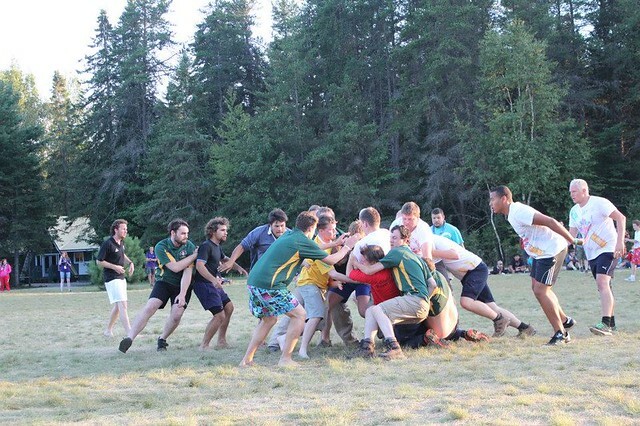 Photo of a tackle in the rugby game … I’m helping! I was however less successful at tackling, as early in the game I was unable to move out of the way of a British gentleman who strongly resembled a brick outhouse before he was brought down on top of my knee. Hobbling from the field, I gladly surrendered my place to a Rover who hailed from the north of the Barassi Line; while Jenna our wonderful Contingent First Aider bandaged me up. It soon became apparent that while we were out for a good time, our opposition were keen to make up for the decline of the British Empire over the past sixty years — possibly they had been incensed by the sight of flags of so many countries that they used to own, and were playing to win. Needless to say, Jenna’s skills were often required and we were beaten. Once the rugby was over, it was time for the Australia – England cricket match. Along the north side of the cricket field we set up Bay 13, because ‘strayla. The crowd was very well behaved though, while they may have heckled the English batsmen all through the first innings; they were just a quick to stick it to Scotto, the wicketkeeper, and to the rest of our own team after the changeover. I think a bowler or two may also have copped it. But it was all for naught, as we lost the cricket game as well, meaning that England would retain the Moot Ashes for another four years. The final day was scheduled as “reflections day”, but a better name would have been “photograph day”, as there were ‘official’ pictures being taken left, right and centre. If you had a look at the photo of our official contingent messaging system earlier, you’ll see that while we needed our shirt and scarf for the official photograph, pants were optional — as per one particular reading of Policy & Rules. There had been some friction between different groups due to the requirement that National Contingents wear stone coloured pants, but as you can see below on the right, we fixed that problem. 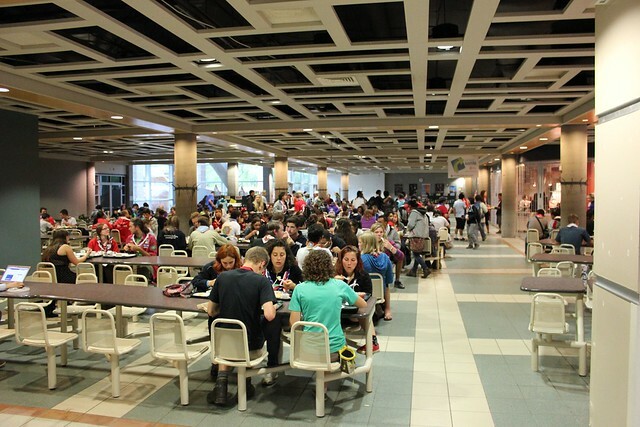 There was even a picture taken of everyone who was at Moot… it took a lot of organisation, and took soooooooo loooooong. I mentioned earlier that the shower facilties weren’t the best, but that there was a lake nearby. Suffice to say, the Canadians were unimpressed by a common logical solution to this problem. After the afternoon of photography was completed, it was time for one last interpretation of a community dinner… this time with a difference, as since the main tent was about to be used for the closing ceremony we weren’t able to eat out of there. So, since we were all leaving anyway, the cordon was dropped and everyone ate out of the staff catering area — this of course led to there being three massively long lines all wrapped around each other. This proved a blessing however, as after a quick investigation you could tell that one line was substantially shorter than the other two. Finally, it was time for the closing ceremony. 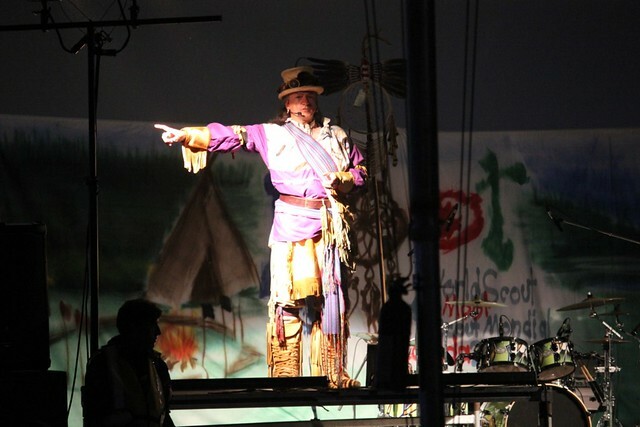 The MC was dressed in a very interesting style, one that I can only describe as “First Nations Willy Wonka”. I don’t remember much of the closing ceremony, because I was in awe of First Nations Willy Wonka. I do remember watching a video of some Moot highlights, a few speeches, and a presentation from Iceland, who are going to be hosting the next Moot, in 2017. Iceland’s presentation included showing a tourism video that showed off just how pretty their country is, with geothermal pools, volcanoes, grasslands the Aurora Borealis, and even a few things that aren’t stereotypes. The ceremony ended with a rousing rendition of our specially-written Moot theme song by the guys who wrote it. 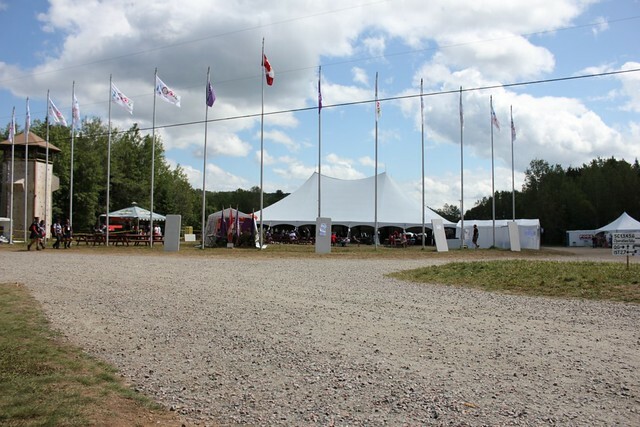 The easiest spot to party was in the main tent as once the band had played the Moot song a few times, they moved on to some “real Canadian cowboy music”, but that was quickly subverted once we established that they knew and liked Lee Kernaghan’s music. I was with a group of people who were country fans, and they were keen to be partying by the stage, so we forced our way up through the 1,000 or so participants. They thought they lost me a few times, but that was just because I spotted some important photos to get in the background of… priorities, right? Unfortunately, I wasn’t up to much jumping after that Englishman landed on my knee and I departed the area pretty quick, making a last trip around the site and swapping my Contingent softshell for an Argentinean jacket. I’d hoped that my knee would stop hurting but surprisingly, all that walking didn’t do it much good. So I was probably one of the earlier people to head to bed. On the final day, I awoke, packed my sleeping bag into my actual bag, strapped it to my back and pulled my day/hike pack onto my front and strolled out of Subcamp 2 for the last time. I didn’t have much faith that our airport transfers were going to go well, so I intended to be out of there as soon as possible. Reaching the waiting area, I discovered that Brother Gogerly had obtained a whole box full of Lucky Charms — so that was breakfast sorted… We sat at our usual table and waited to see what would unfold. From there, I hopped on my final yellow schoolbus and headed off to Ottawa. By this time I had a pretty good understanding of the way to get to the capital, so when the bus driver went straight past the entrance to the motorway, I figured that there must be a better route to get to the airport… that hope was dashed once the next turn we took was back in the direction of the campsite. Opps, someone made a wrong turn. 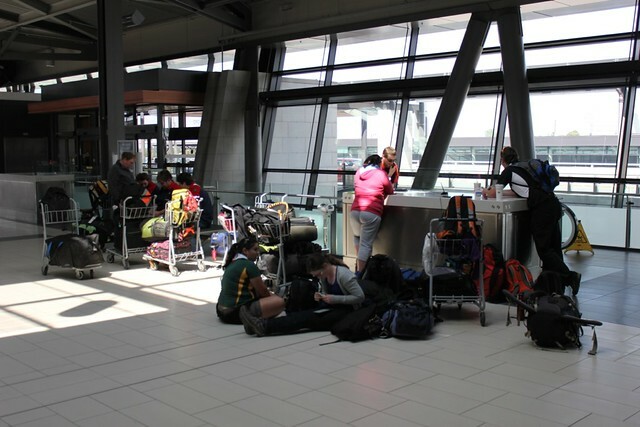 It was many, many hours before our flights were to depart, so a base camp was soon set up by the guys who were going home on the contingent organised flights. Since I was leaving about the same time as them, I joined them in huddling around the two undefended power points we were able to find — Ross had been prepared enough to bring a power board along with him, so everyone was able to get their stuff all charged up for the journey home. 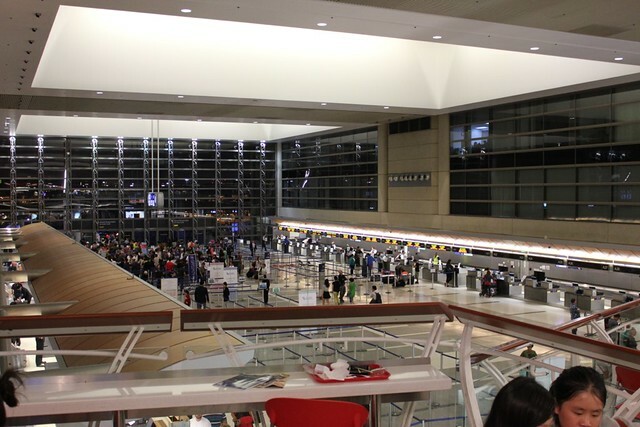 LAX by night… too many people! After a while of hanging out in the airport, a pair of Italians decided that they would race their baggage trolleys along the concourse. Thinking that looked like it was a lot of fun, I thought it best to forbid us from taking part. Apparently this was enough to get me nominated as trip leader for the flight home — either that or the fact that I would not be travelling with them, I’m not sure. A cool thing about Ottawa Airport is that if you are departing through a certain few gates, you can actually clear US Customs before leaving Canada; an arrangement that has led to probably the weirdest stamp in my passport. The TSA Agents weren’t too keen on my torch though, they made me take it out and demonstrate it was just a light. It was all fine though, and soon I was enjoying the experience of the most rescheduled flight on my itineracy, UA3810. It was aboard a tiny little plane, one that I couldn’t actually stand up straight in — called an Embraer RJ 135. Chicago was OK, aside from it’s lack of wi-fi, but I was only there for about 40 minutes so before I knew it, I was on to the most worry part of my flight home, the LAX segment. This time I was all by myself as my companion from the ride over was going home via Europe, so I had to try and figure out how to find my baggage, get from Terminal B to Terminal 2, do checkin, make my way through the TSA checkpoint and get to the right gate all within an hour and a half. I managed to do it, but the 7 terminal long walk was not a joyful one — nor was the wait in the extremely long security checkpoint line. The staff of both airlines were very helpful though, so I was able to find my way to a Qantas plane named after Reginald Ansett. And after that? Melbourne! 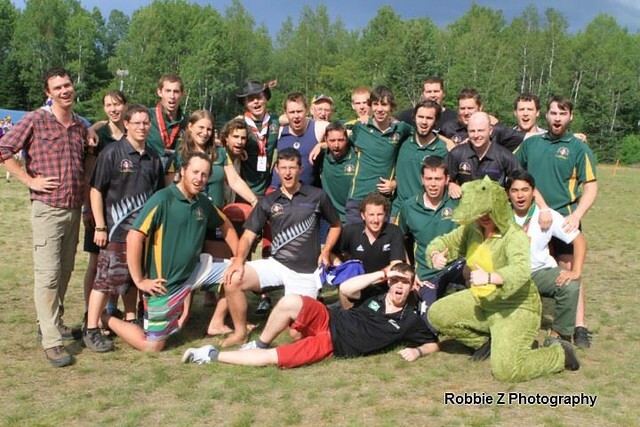 More photos about my Moot experience are in this Flickr album.